The ostrich's diet consists mainly of plant matter, though it also eats invertebrates. They usually weigh from 63 to 145 kilograms (139–320 lb), or as much as two adult humans. 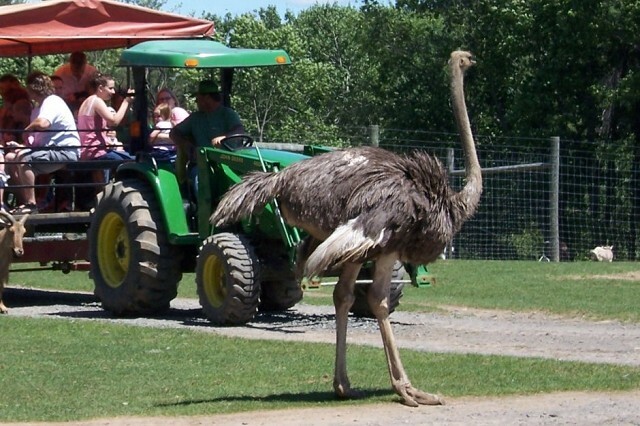 The ostrich is farmed around the world, particularly for its feathers, which are decorative and are also used as feather dusters. Its skin is used for leather products and its meat is marketed commercially, with its leanness a common marketing point. The feathers of adult males are mostly black, with white primaries and a white tail. However, the tail of one subspecies is buff. Females and young males are greyish-brown and white.